Check out Jack Mathes’ testimonial about his Magnum 27′ Sport! My first ride in a Magnum was when I went with my father (Jack Sr.) down to the Magnum factory for a demo in a 27’ Sport. I remember the long sleek deck looked like an aircraft carrier deck. My father and I were quite impressed with performance. We signed up to be a dealer for Magnum Marine at our Emerald City Harbor marina, and the rest is history. “Jack Jr. raced with Wally Harper in his two 27’ Sports Li’l Smidgen and later Li’l Smidgen Too. Together they won countless races from 1971 to 1978. 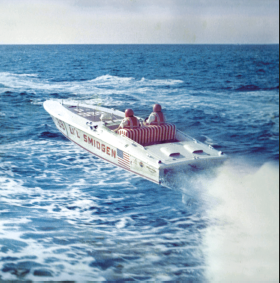 The Lake St. Clair natives would take the fight to the Florida ocean racers in production class proving that the ‘lake boaters’ had what it takes to win some of the toughest ocean races of the era,” writes Jeff Hall.